Lisa Quale Interiors is proud to announce the selection of this recent Bathroom Remodeling project as the winner in the “Best Custom Bathroom” category at the 2017 Synergy awards. The Synergy Awards honor excellence in construction, sales, and design among members of the Home Builders Association of Chester and Delaware Counties and the Home Builders Association of Bucks and Montgomery Counties. 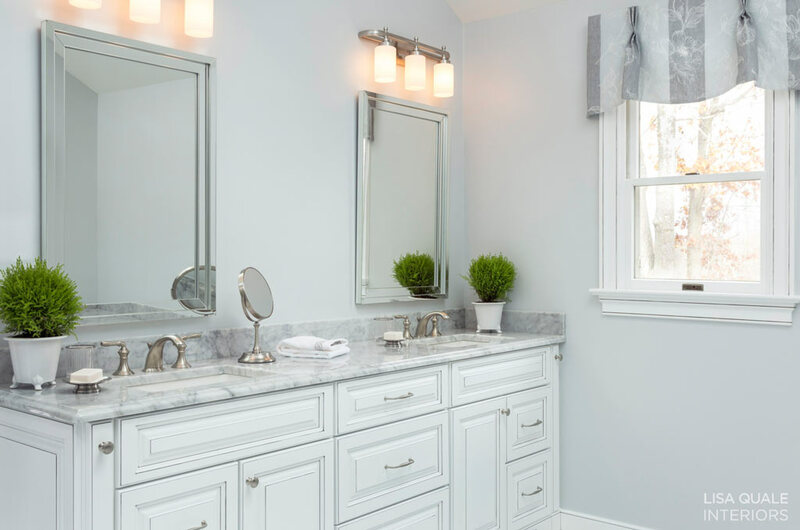 Lisa Quale Interiors redesigned this dated North Wales master bathroom into a relaxing carrara marble retreat. Unique storage features were incorporated into the custom cabinetry made by Amish craftsmen. Traditional profiles in the raised panel cabinetry and millwork were highlighted with a slate grey glaze. The undermount rectangular sinks were echoed by the stepped mirror frames and contrasted by the curves of the brushed nickel faucets. 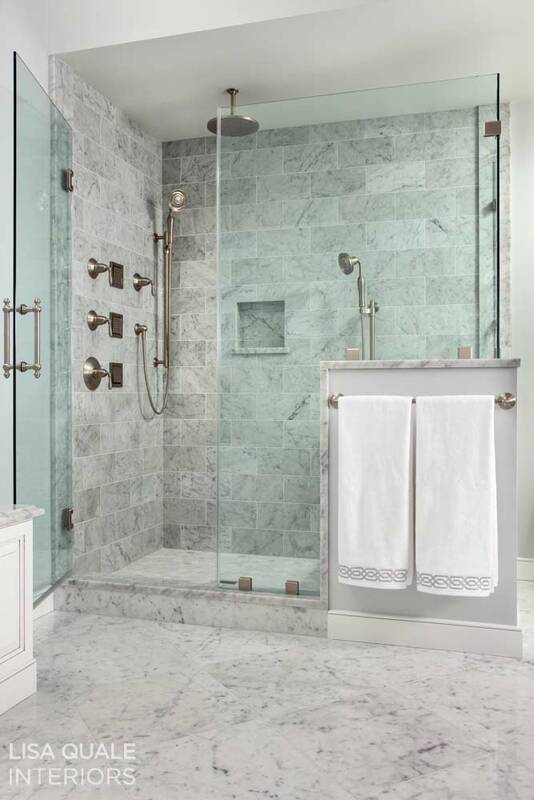 Details like a seamless slab tub deck, slab shower jambs, and radiant heat flooring added to the luxurious design. The shower, which doubled in size, is now a spa-like experience with the addition of the rainshower head, body sprays, and hand showers. The shower surround field tile is a classic brick tile but in a contemporary 6” x 12” size with coordinating 2” hexagon shower flooring. Diagonal, large format 18” x 18” floor tiles were used to minimize groutlines and make the room appear larger. Triple vanity lights were placed over each mirror. The embroidered window valance was pleated to take advantage of a tonal stripe and was mounted high to elongate the small window. Paint and fabrics were selected in soft blue-grey and white to create an airy and peaceful, low-contrast space that is truly award-worthy. Lisa Quale Interiors is an Award-Winning Interior Designer who can help you with your Kitchen or Bathroom Remodeling project. Contact us today to see how we can help transform your home. Media, Wilmington DE, Wayne, Devon, Downingtown, King of Prussia and Malvern PA.